School is back in session, the holidays are right around the corner, and Pumpkin Spiced Lattes are officially back at Starbucks. So you might not think that now is the best time to sell your house. But with inventory below historic numbers and demand still strong, you could be missing out on a great opportunity for your family. 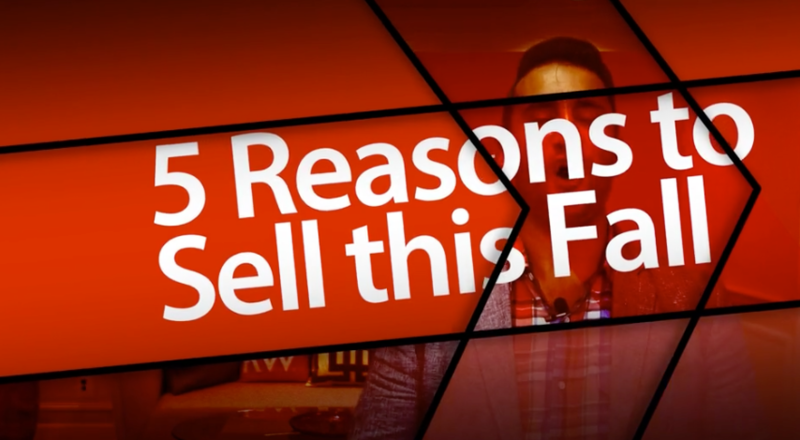 On this episode, we will give you five reasons why you should consider selling your home this fall. The latest Realtors’ Confidence Index from the National Association of Realtors (NAR) shows that buyer demand remains very strong throughout the majority of the country, including here in New Jersey. These buyers are ready, willing and able to purchase… So Take advantage of the buyer activity currently in our market. According to NAR’s latest Existing Home Sales Report, the supply of homes for sale is still under the 6-month supply that is needed for a normal housing market. It means, that in most areas, there are not enough homes for sale to satisfy the number of buyers in that market. This is great news for home prices. However, with everyday that passes additional inventory will come onto the market. In turn, buyers will have more choices as more inventory enters the market. Don’t wait until all this additional inventory of homes comes to market before you sell. If you are moving up to a larger, more expensive home, consider doing it now. Prices are projected to appreciate by 5.3% over the next year, according to CoreLogic. If you are moving to a higher-priced home, it will wind up costing you more, both in down payment and mortgage payment, if you wait. Even a small increase in rate will have a big impact on your bottom line. Hey, look at the reason you decided to sell in the first place and determine whether it is worth waiting. Is money more important than being with family? Is money more important than your health? Is money more important than having the freedom to go on with YOUR life the way YOU think you should? Only you know the answers to those questions. Remember, YOU have the power to take control of the situation by putting your home on the market. Perhaps the time has come for you and your family to move on and start living the life you desire. That’s what truly is important! So there you go, the top 5 reasons you should consider selling your home this fall. Fall officially starts on September 21st, so lets not waste another day. Give me a call, shoot me an email or text message and we can discuss your current situation and I can show you how to get the most money from your home now. I hope you enjoyed this video blog post. Stay connected on our website at www.getrealnj.com for the latest in the New Jersey real estate market. I look forward to working with you. Until next time, thanks for watching.